RFMW, Ltd. announces design and sales support for TriQuint Semiconductor’s T1G4003532-FS, DC – 3.5GHz GaN transistor offering 35W P3dB at 3.5GHz and over 40W P3dB midband. Gain at P3dB is as high as 20dB while linear gain is >16dB. 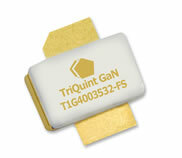 The TriQuint T1G4003532-FS uses a 32V supply and only 150mA of current. Overall efficiency is up to 70%. The –FS flangeless package offers low thermal resistance and is easily soldered down. Also available is a flanged package in the T1G4003532-FL. Both TriQuint transistors are ideal for military and civilian radar, jammers and communications systems where high gain and high efficiency are required. The T1G4003532-FS is available from stock at RFMW, Ltd.